A promise to yourself is not about the end goal. It’s about how you live your day-to-day life. If you find resolutions hard to stick with, you’re not alone. Resolutions can feel unforgiving and it’s too easy to fall off the wagon, especially in the post-holiday haze. How about reframing resolutions? Instead, think of them as promises to yourself. A promise to yourself is not about the end goal. It’s about how you live your day-to-day life. It’s about the little things you do, as often as you can, not to reach an objective, but to cultivate a life that feels good to you. If you do nothing else in 2019, do this. Acts of kindness are stones in a pond, creating unstoppable ripple effects over everything around them. Promise yourself kindness and promise you will aim to choose kindness first in how you interact with others. No matter what you always have control over the most powerful element: You. Bring the best of yourself to whatever circumstances arise. You may not always get the result you want, but you’ll always be able to feel proud of how you handled the situation. It’s easy to look at everything happening in the world with a sense of defeat. How can we ever hope to heal all the hurt around us? You can’t. And focusing on that helps no one and drags you down. Focus on what you can do, however small, and do it. As Eleanor Roosevelt advised, do one thing each day that scares you. Now, she never specified how big of a scare it had to be. Start with a discomfort level you can handle and build up. For one person, that may mean trying a new coffee shop. For someone else it could mean jumping out of a plane. Get out your pom poms and cheer yourself through it. Once you get comfortable, push forward again. Do you want stronger relationships? More adventure? New experiences? Greater knowledge? A more joy-filled career? Fear is life’s greatest anchor. And for too many of us, it keeps us feeling empty. Choose to direct yourself towards the abundance you crave, regardless of any fear holding you back. Want to know a secret of adulthood? You’re allowed to say “no”. It’s your life and you have the power to choose what you want and don’t want. If something is causing you stress, it impacts your health, both physical and mental. Put your health first because no one else will do that for you. There’s no other way to say this: We get one earth. One. We don’t have a plan B. NASA’s working on it, so maybe one day. But until then, we’ve got to preserve what we have. Be conscious of the choices you make and the impact your choices have on the world around you. They’re not your beliefs, so why live by them? Take the time you need to figure out what it is you truly believe, not what you’ve been told to believe, and live by that. You know the expression, “Fake it till you make it?” That’s what bravery is about. It’s not about being fearless. It’s about looking fear dead in the eye and saying, “Not today, sir!” Then pulling up your big kid pants and getting on with it. Choose bravery. It’ll always get you where you want to go. You know how we only get one planet? Well, we only get oneself, too. You are the only you you’re ever going to get. And what you got is more amazing than you can imagine. Your self is so packed with potential and possibilities. Stop believing there are limits on this awesome thing you’ve been given. You are limitless. You and I have probably never met. But I’m going to ask you to make me a promise anyway. 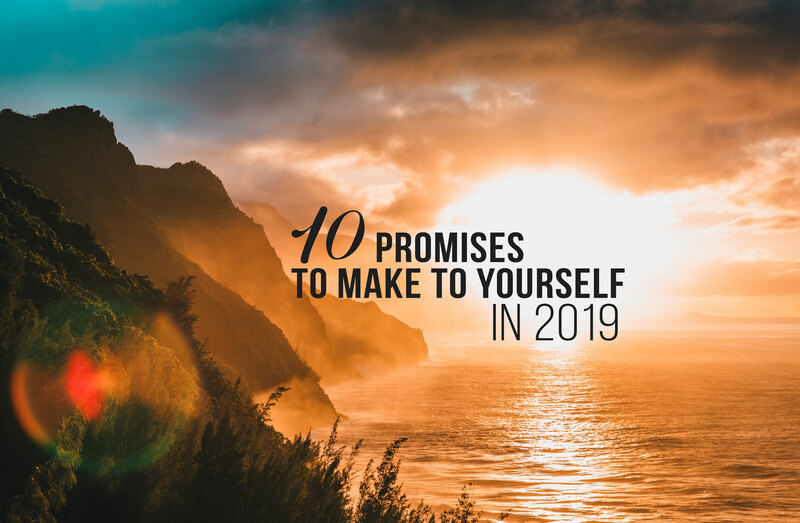 Promise me you’ll make these promises to yourself for 2019. And then all you have to do is your best.